Below you will find a list of all the Golden Reef Casino bonuses - offered to new players. The right side offers a casino overview (click to scroll through the images). 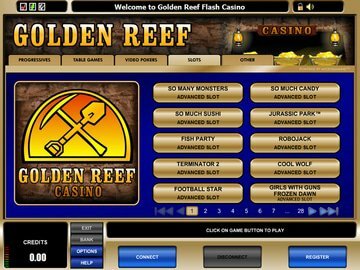 Golden Reef casino was established in 2001, operating on Microgaming software, and they continue to produce top quality gambling for the Canadian and global market. The trusted brand is focussed on delivering a safe and fair gaming environment and as such they are affiliated with the Interactive Gaming Council and their payouts audited by eCogra. Their Casino Rewards online loyalty program remains one of the most lucrative in the market, and paired with their extensive game menu, Golden Reef has all of the groundwork in place needed for superior gambling online. Their mobile casino is not yet up and running but there are many other fabulous members of Casino Rewards that do offer gaming on iPhone, Android mobiles, iPad, and other mobile platforms. The multi-lingual site is available in both full-download and on an instant play Flash platform. Golden Reef has a buzzing winners list with CAD payouts rolling out every single day of the week. The very first win that was recorded for 2014 was on the 6th of January, where C$4,579.20 was paid out on a single spin on Avalon II, to player 'D.N.' from Vancouver, British Columbia. L.G. from Kelowna, British Columbia was one of the first Canadian players to cash in on a five-figure sum this year, winning C$10,230.50 on Mark of Medusa video slot in February. Sign up with Golden Reef and check out the winners list where the latest top payouts made in CAD feature, many of which were landed by playing free with a Golden Reef casino bonus. The Golden Reef casino bonus presented to first-time players is a bit bland, as it only offers a 1st deposit match of 100% up to C$100. The premier online loyalty program however bestows amazing benefits, ongoing incentives and excellent perks for VIP players. Players can access their loyalty benefits at any of the 29 members of the loyalty program. There is also a chance to receive free cash with Rewards Buddies for successfully referring fellow Canadian players who then make a real money deposit. using a bonus code to claim free spins or no deposit offers is not really the norm at Golden Reef, although these can come in the form of exclusive promotions for their loyal clientele. You needn't wait to receive a bonus code to redeem offers such as re-load bonuses, promotional free spins on new slots and match bonuses however, as these are all standard at Casino Rewards sites! Golden Reef casino is powered by Microgaming software and offers access to over 500 games. The table game menu is extensive, comprising standard baccarat and Baccarat Gold, numerous varieties of blackjack and poker including Pai Gow, War and Red Dog, roulette games, craps, and even exclusive games like Spingo - a fusion of roulette and a lottery-style game. The slots menu consists of over 350 games and is an amalgamation of classic slots and video slots, with advanced games like Untamed Crowned Eagle, Girls with Guns Frozen Dawn, the Rhyming Reels slots series, and much more. Video poker lovers can access a satisfactory game list that has all of the classic games and Microgaming inventions such as Level Up and Power Poker. Players can also enjoy specialty games like Keno, scratch cards and bingo. Irrespective of the absence of a mobile casino, the Flash product and downloadable software is more than sufficient for Canadian players who prefer gambling online. iPhone, iPad and Android mobile users can check out our other reviews for a venue that will support gambling on your device. The software is available in many languages, including Danish, French, Portuguese, Italian, German, Chinese and many others. Canadian players can comfortably transact in CAD via credit cards or debit cards like VISA and MasterCard. Banking is also facilitated through uKash, Paysafecard and Instant Banking by Citadel. The support team is extremely efficient and knowledgeable and live chat responses are pretty much instant. Canadian citizens have access to a toll-free contact number, as do players in the UK, Denmark and Germany. They also offer customer support in different languages, including French, Japanese, Swedish, Spanish and Norwegian. Agents are contactable at all hours, every day of the year. 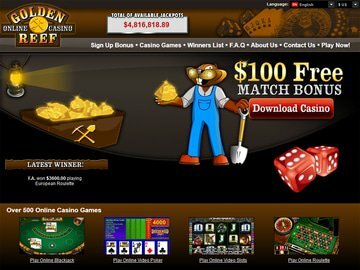 For what they offer, Golden Reef casino does fulfil all of the criteria that makes for high quality online gambling, and this includes a high payout percentage, which is evident in their winners list. The 1st deposit bonus is not that impressive but Casino Rewards has a good reputation for always having satisfying promotions for current members to cash in on.